We’d love your help. Let us know what’s wrong with this preview of I Woke Up Dead at the Mall by Judy Sheehan. When you’re sixteen, you have your whole life ahead of you. Unless you’re Sarah. Not to give anything away, but . . . she’s dead. Murdered, in fact. Sarah’s murder is shocking because she couldn’t be any more average. No enemies. No risky beha When Sarah wakes up dead at the Mall of America, she learns that not only was she murdered, her killer is still on the loose. To ask other readers questions about I Woke Up Dead at the Mall, please sign up. how many words are in it? Is this the first book in a seireis? or is it a seiries at all? Grace Hernandez It's not a series, just one book. First of all, I thought the premise was unique. Instead of Sarah becoming a zombie or a vampire, which is what I thought was going to happen, she's a ghost—dressed in the same mango chiffon bridesmaid gown she was wearing when she died. Oh, and she's at the Mall of America, the place, she learns, where all murdered New Yorkers end up. Before they can move on, they must accept their untimely demise and find peace. But wait... she wasn't murdered... or at least she doesn't want to believe she was. This book is not silly fluff. There's a really great story here. Sarah is your basic "every girl"; however, while she may have been somewhat invisible in life, she comes into her own in death. She is clever and kind, and she is determined to make the most of her afterlife. She occasionally opines on time wasted and opportunities not taken in her short life, which is something we should probably all consider, regardless of age. The supporting cast of characters, especially Nick, are well-defined and have a surprising amount of depth. They all evolve in some way, as does Sarah, which is rare (imo) in many YA stories. The author also does a great job with quirky details such as the ghosts being able to choose new clothes in certain ghost-friendly stores of the Mall. They can even pig-out at the Food Court without worrying about calories! This book is a lot of fun. Vivid and believable narrative voice, great premise, and a fantastic sense of humor throughout. I do not personally want to end up in a Mall of America afterlife (though I guess there are worse places, ha), but I so enjoyed following Sarah's journey and the cast of (dead) characters she met. There's a dash of zany murder mystery here, which adds to the fun, and an interesting examination of how we humans deal with dying. Highly recommended. The writing is juvenile. The characters are undeveloped clichés. Nothing is properly developed, not even the cheesy teen romance. By now some of you are probably saying, "oh, you're being too harsh just because this isn't for you." Thing is, I would never in a million years give this book to a middle grader, or even a teen. And that is because this is one of those books, that manages to not develop a decent plot so that it can gush about a stupid, maybe toxic romance. For those who have read this, you're probably thinking, "oh, but Nick is a good guy!" Yes, Nick is not a bad guy for a sixteen year old. But I found him manipulative, and in the end of the story, I was left with a bad taste in my mouth, because I couldn't help feeling that another women got sidetracked of all her potential because of a guy. This book started strong and I really loved the premise, but then the instalove and totally bland storyline really ruined it for me. I did not get a sense that the main character was "special" in any way, but she broke rules of the afterlife over and over again. Disappointing. The title describes this book perfectly! And the cover is exactly right, too. Sarah does just what it promises, awaking in the mango bridesmaid's dress she was wearing at her father's wedding, only to be informed that she is, sadly, very dead. However, dead teens get to spend a few days at the Mall of America, adjusting to their new status, attending their own funeral, and reliving one day of their lives of their choice. This was a very fast-paced blend of mystery, romance, and teen movie, as Sa The title describes this book perfectly! And the cover is exactly right, too. Sarah does just what it promises, awaking in the mango bridesmaid's dress she was wearing at her father's wedding, only to be informed that she is, sadly, very dead. However, dead teens get to spend a few days at the Mall of America, adjusting to their new status, attending their own funeral, and reliving one day of their lives of their choice. While the story reminded me just a bit of the TV show "Dead Like Me," it's also very much its own creative entity. I enjoyed the mystery, which was taut, well-paced, and full of surprising twists, and I loved the poignant moments as these kids each come to grips with the truth of their short lives and deaths. Sarah's snarky voice keeps the story from ever feeling overwhelmingly sad, but the sadness is there under the funny observations and dry wit, providing an anchor to everything else. The book isn't perfect, but it is a unique little gem that only took me a day to read but is sticking in my memory fairly vividly, which is a real achievement these days, when I sometimes look at my GR review list and think, "Did I read that?" because a lot of books are not that memorable. I woke up dead at the mall is a totally new approach to the ten ghost genre. It's cute, sweet, heartfelt and has an ending that makes you feel complete and satisfied. A quick and enjoyable read. This review is based of an ARC that I found at a goodwill. It was a 3.5 book that I rounded down. I did really enjoy it. There was nothing new or profound and I never really felt worried for any of the characters. It was light, simple, and fun. Nick and Sarah's relationship wasn't 100% believable with how "in love" they were supposed to be, but it was cute. Nick, though adorable, was a bit (in my opinion) skeezy in how fast he moved on to Sarah. There are a couple of things that bothered me - ster This review is based of an ARC that I found at a goodwill. There are a couple of things that bothered me - stereotypical characters, the convoluted afterlife that tries to avoid mentioning any religion but throws all different ideas in (reincarnation, angels, etc) and doesn't quite come up with a clear system, the murders of the teenagers are so glossed over that it feels incredibly unrealistic, the outdated and dated references - Oprah, Charlton Heston and the Ten Commandments - that teenagers today don't really know about, and the fact that 16 year olds are able to chose their own fate for eternity! However, there are some things I really liked - the fast friendship that formed between the characters, how Harry lived and died, Lacey's growth and non growth (despite the fact that she was a pretty glaring stereotype of a POC, or if not, read like one), the fact that Bertha died in the Triangle Shirtwaist Fire, and Sarah. I absolutely love this book!!! It had the perfect balance between comedy and drama... But more on the comedy! Judy Sheehan will make you stay up until the crack of dawn reading! What a fun little book. "Get ready for your funeral"
"Hey, did you know that Mexican words and Spanish words sound a lot alike? I wonder how they tell them apart"
So this was a nice, light, teen read with some fun and interesting ideas on the afterlife. The lead character Sarah was mildly annoying at times, primarily because she was written quite well and often acted like a real 16 year old would probably act. Ugh, youths. Also, there was a decent message in the book about not wasting your time or letting life pass you by which I can totally get behind. Funny, snarky, sweet. A bit silly, but still fun. Witty and funny. Pub recommended it since I enjoyed Denton Little's Death Date. Great read for my first of 2016! 16 year old Sarah wakes up dead. At the Mall of America. She must take steps to let go of her mortal life so she can move on. Once she tackles her unfinished business she can be free from the mall, and her own sadness. Despite the title and the topic, there is so much joy in this book. I loved this particular line: "So it turns out the at when dead people sleep, they sleep reeeeeeeeeeally deep. That first night at the mall I slept like someone had drugged me, then clubbed me, then made me watch 16 year old Sarah wakes up dead. At the Mall of America. She must take steps to let go of her mortal life so she can move on. Once she tackles her unfinished business she can be free from the mall, and her own sadness. Despite the title and the topic, there is so much joy in this book. I loved this particular line: "So it turns out the at when dead people sleep, they sleep reeeeeeeeeeally deep. That first night at the mall I slept like someone had drugged me, then clubbed me, then made me watch golf on TV." Sarah's companions in the mall were so interesting and their stories were so touching, that I can see this becoming a series. "A little bit underwhelmed." This is probably the best way to describe my initial thoughts about this book. To be perfectly honest, there was nothing particular about this book that spoke to me or got me so excited and anxious to know what's going to happen next. I must admit there were moments and scenes that got me intrigued to some extent, but overall, I felt the ending a bit too convenient and contrived, not to mention anticlimactic. I was a bit disappointed to say the least. I was expecting "A little bit underwhelmed." This is probably the best way to describe my initial thoughts about this book. To be perfectly honest, there was nothing particular about this book that spoke to me or got me so excited and anxious to know what's going to happen next. I must admit there were moments and scenes that got me intrigued to some extent, but overall, I felt the ending a bit too convenient and contrived, not to mention anticlimactic. I was a bit disappointed to say the least. I was expecting more from this book. Sure, this book is a delightful read. The writing is a bit juvenile, yet it's crisp, brisk and reads well, flows well. Given the heroine, Sarah is only 16 years old when she wakes up dead at the mall , that stands to reason the writing, the overall vibe of the book is a bit impulsive and foolhardy (because that's what Sarah is like). And I actually like the way it was written. As I mentioned earlier, it flows well. Really crisp and upbeat. The narrator's performance is absolutely fantastic. She made what is already delightful even more enticing and fun to follow. Listening to this audiobook is really a great experience. I totally enjoyed that. Sadly, however, the overall plot, especially the ending ruined this book for me. There were some interesting and entertaining elements in this book such as friendship, vivid characters (like Lacy), and the descriptions of 'afterlife'... the subplots take place at the mall were unique and fresh, and Sarah's reminiscence of her mother tugged at my heartstrings and made me a bit welled up. But then again, as I said earlier, nothing spoke to me as much as I had expected. Almost everything in this book flew past me and nothing stuck with me, even the romance between the main two characters,　Nick and Sarah, which is kind of disappointing. I did find this romance twist interesting yet it didn't make my heart dance around. It only gave me a faint sizzle, and then the whole plot turns into Sarah's numerous try-and-error attempts to save her Dad from the wicked hands of the (visualize air quotes) 'killer' who murdered Sarah. The sad yet beautiful recollections with her Mom are all but forgotten, the plot suddenly gets all about "who did it?," giving off a cozy-mystery vibe. In actuality, that was fine. What bothered me was that it kept me on my toe, anxious to know how it'd end up but then left the most important (at least for me) question unanswered because Sarah is all happy and ready to finally 'move on,' which didn't add up to me very much. I hate to say this, but my interest deflated instantly at that moment. I did enjoy listening to this audiobook and I did find another twist with her Mom a breath of fresh air (and clever), BUT (a big But) I must say I felt a bit underwhelmed. The ending kind of fizzled out for me. I was underwhelmed by some things, but pulled through by things I wasn't expecting. I picked this up thinking it might be a good readalike for the show "The Good Place," which is trending in my friend-group. I'm not sure how many teens, much less middle schoolers, are into that show, but it fits in the snarky niche of my middle school booktalk lineup. The title/cover doesn't lie - Sarah wakes up dead in the mall. In a giant bridesmaid's dress. I was looking forward to enjoying exploring the mall-a I was underwhelmed by some things, but pulled through by things I wasn't expecting. I was looking forward to enjoying exploring the mall-as-afterlife, but turns out, it's more complicated than that. I won't spoil the details, but the Mall isn't a universal afterlife in this story. I also wasn't as charmed by the writing/character as I thought I might be after hearing others review it. Sarah is a privileged white girl, and I've been trying to read fewer stories about people who have been the stars of media for all of modern life. There's also a fairly run-of-the-mill instalove hetero romance, and these days it takes a lot for a heteroromance to actually interest me. But I recognize that that's a personal lens issue I have. All that said, I was feeling underwhelmed, and then the hook totally surprised me. In a really good way. (view spoiler)[All of the people in the mall were murdered. (hide spoiler)] And the book turns into a different kind of story. A mystery, actiony thing that the parts of me that read hundreds of Nancy Drew stories really really liked. So yeah, there are people who will like the writing here more than I did. There are people who will like the setting more than I did. I ended up liking this for the plot. I'll be taking this out to middle schools in winter 2018. This book was one of the most creative and interesting books I have ever read. It wasn't your normal go right to heaven when you die type of book. This book has a different view on that, if your murdered you go to a mall, and if you’re a New Yorker you go to the Mall of America. At the mall you have to forget about your past life to be able to go on to your next life. Which Sarah has a hard time doing. Sarah was sixteen years old when she was murdered. She woke up at the mall of America in her ma This book was one of the most creative and interesting books I have ever read. It wasn't your normal go right to heaven when you die type of book. This book has a different view on that, if your murdered you go to a mall, and if you’re a New Yorker you go to the Mall of America. At the mall you have to forget about your past life to be able to go on to your next life. Which Sarah has a hard time doing. Sarah was sixteen years old when she was murdered. She woke up at the mall of America in her mango chiffon bridesmaid dress. The last thing she remembers is being at her dad's and new step-mom Karen’s wedding. At the wedding the last thing she remembers is her stomach hurting extremely bad. At first she has no clue how she ended up murdered because she had no enemies. She thinks that she just had food poisoning and that she shouldn't be at the mall. Soon she finds out that Karen was the one that poisoned her and it wasn't Karen's intentions to kill her, she wanted to kill Sarah's dad .Sarah needs to find a way to get to her dad to save his life. At the mall she meets her “death coach” named Bertha, and some teenagers who have also been murdered Alice, Lacey, Harry, Declan and last but not least Nick. Sarah and Nick end up falling in love at the mall and Bertha is not a very big fan of love at the mall. “And it felt like I was a black - and - white photo magically rippling into color wherever he touched me.” That quote shows how Sarah felt whenever he touched her. Nick needs to go help his mom get over his death. Sarah wants to save her father’s life. The only way to leave the mall is to forget their past life. Nick and Sarah cannot move on until they complete this task. I thought this would be a funny, sarcastic look at life after death - and it was - but it was also equal parts poignant and uplifting. And even though that's not what I was expecting or even looking for with this book, I found it endearing. A really good mix of funny and poignant, and the ending was wonderful. This is one of the best books of I've read so far this year. I love the characters, setting and the phasing of the story. This book also made me ponder if there's a truth on life after death. Or if we will also have a chance to choose whether we want to reborn again or to protect once we are ready to move on, just like what happened to the characters in this book. I really enjoyed reading this and I highly recommend it to anyone who loves light reading and a fast phasing story. If you are looking This is one of the best books of I've read so far this year. I love the characters, setting and the phasing of the story. This book also made me ponder if there's a truth on life after death. Or if we will also have a chance to choose whether we want to reborn again or to protect once we are ready to move on, just like what happened to the characters in this book. If I had to sum this up in a line, I would say it's cute and clever. In I Woke Up Dead at the Mall, Sarah wakes up dead. In a mall. The Mall of America acts as a sort of purgatory for teens in NYC who have been murdered. While they're there, they can eat at the ghosts' only cafeteria, shop the specialty stores, and attend group therapy sessions to help them move on. They get to choose one day of their life to "re-live" and they get to attend their funeral. But Sarah's murderer is trying to kill If I had to sum this up in a line, I would say it's cute and clever. In I Woke Up Dead at the Mall, Sarah wakes up dead. In a mall. The Mall of America acts as a sort of purgatory for teens in NYC who have been murdered. While they're there, they can eat at the ghosts' only cafeteria, shop the specialty stores, and attend group therapy sessions to help them move on. They get to choose one day of their life to "re-live" and they get to attend their funeral. But Sarah's murderer is trying to kill her dad too, and she's going to break the rules to save him with the help of her new, dead friends. Of course, if she lingers too long, she risks becoming a "mall walker," where she'll wander the mall in a hopeless haze for all eternity. From the summary, this sounds incredibly unique, and pieces of it are. Mall purgatory. Group ghost therapy. The storytelling is also funny and different, with call outs for each person to tell their death story. But it's very heavy on the sarcasm, and as I know from constantly wearing my own sarcasm armor, it's a defense. Not a personality. Because Sarah is constantly using her humor, we never get to know her, and as she describes her own personality, she claims she was no one. A wallflower in the background. That being the case, she's not the most exciting character to follow around, and the insta-love romance becomes even more questionable. I feel like the "magical" ability could have been completely left out of the story without affecting it at all. It seemed like way to make Sarah special instead of giving her a personality to do the same thing. Also, I think the author made the murder cliche on purpose, to make it a joke, but the joke sort of landed flat. a lot of the same elements as this with a completely unique twist. We really should be trying to outdo books from 20 years ago. Not fall behind them. This one had been on my TBR pile for a bit, until one day I decided to try something different - beyond my usual fare of nonfiction and murder mystery. I'm a fan of well-done YA, which fits here, mostly. I put this one on my library ebook watch list as I really liked another title with a dead-teen-in-the-afterlife plot Elsewhere. I confess I liked that one a bit more, probably as I found it less . . . distracting. My loyal fans know of my dislike of plot re-hashing, so here's a basic plot summary This one had been on my TBR pile for a bit, until one day I decided to try something different - beyond my usual fare of nonfiction and murder mystery. I'm a fan of well-done YA, which fits here, mostly. I put this one on my library ebook watch list as I really liked another title with a dead-teen-in-the-afterlife plot Elsewhere. I confess I liked that one a bit more, probably as I found it less . . . distracting. My loyal fans know of my dislike of plot re-hashing, so here's a basic plot summary: Sarah learns she was actually murdered, ending up at a level of Mall of America (a real location in Minnesota for my readers abroad) for the dead, or at least dead kids. Allowed to be present at their own funerals, as well as pick one day of their life to revisit (observe not be living), kindled the idea in Sarah's mind to save her dad from her scheming stepmother. So, she finagle a couple of attempts, and we'll leave it at that. She's part of a small cohort of dead kids who arrived at the same time, so there's a Superhero combination effort for them to deal with stuff and move on: Sarah can be heard by the living, Nick can seen, Lacey can push buttons and move objects (the rest go right through stuff). The kids have wristbands that are sort of like Mood Rocks (sorry, I'm old!) that are red when issued reflecting resentment of life issues, but fade to white when the kid is ready to "move on". Strength of the story comes in showing the kids' character development, especially shallow, dim Declan. What I did not care for was the teen romance angle, which though plausible had the feel of being included to hook teen female readers. I skimmed much of it. The representation of God was . . . well . . . different. Verdict: glad I read it, would recommend it, though at times it held my interest more than others (not just the outright romance mentioned). What an interesting look at the afterlife. This was fun and funny, but also touching and sweet. I really enjoyed getting to meet all these dead teens and was rooting for them to figure out their unfinished business and move on. I was also pleasantly surprised by a few things Sheehan wrote into the ending. These things made me very happy, and one of them was worthy of a few tears. The synopsis to this book sounded so interesting, despite the cover not being all that appealing, I just had to give this one a try. I’m so glad I did. I Woke Up Dead surprised me with how entertaining, funny, and relatable it is. I easily connected with all the characters, loved the aferlife world that Sheehan created, and I definitely wanted to see Sarah get her justice and find peace. Right away, Sheehan captured my attention with her engaging main character, Sarah, and I just loved being ins The synopsis to this book sounded so interesting, despite the cover not being all that appealing, I just had to give this one a try. I’m so glad I did. I Woke Up Dead surprised me with how entertaining, funny, and relatable it is. I easily connected with all the characters, loved the aferlife world that Sheehan created, and I definitely wanted to see Sarah get her justice and find peace. Right away, Sheehan captured my attention with her engaging main character, Sarah, and I just loved being inside her head. So, we’ve got a bunch of teenagers who were all killed one way or another and they end up at The Mall of America, where I’ve always wanted to check out. I loved the setting. I mean, who wouldn’t want to be at a mall where everything is free and you can eat whatever you want without gaining weight?! Sure, you’re dead, but you know what I mean. Anyways, the story is about all of them moving on and finishing their unfinished business. Letting go of your past life and embracing your new one. The main focus is, of course, on Sarah, how and why she died, and what she’s going to do about it. There’s a good amount of supernatural stuff going on, dead people aside, that I think Sheehan incorporated very well into the story. We don’t get a rhyme or reason to it, which was a bummer, but we still get a good sense of it. I also really like the romance and Sheehan’s take on fate. 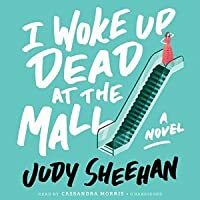 An irreverent and compellingly unique story about death, grieving, and moving on, I Woke Up Dead at the Mall by Judy Sheehan successfully mixes the macabre and morose with a lighthearted twist on the afterlife. Most books that deal with death and grieving tend to be on the dark, serious side. I Woke Up Dead at the Mall is a unique — and quite frankly, brilliant — combination of that dark, serious side with an uplifting, lighthearted twist. The result is an optimistic outlook on this macabre theme An irreverent and compellingly unique story about death, grieving, and moving on, I Woke Up Dead at the Mall by Judy Sheehan successfully mixes the macabre and morose with a lighthearted twist on the afterlife. Most books that deal with death and grieving tend to be on the dark, serious side. I Woke Up Dead at the Mall is a unique — and quite frankly, brilliant — combination of that dark, serious side with an uplifting, lighthearted twist. The result is an optimistic outlook on this macabre theme. What’s more, Sheehan does so without ever getting into that murkiest of subjects: religion. 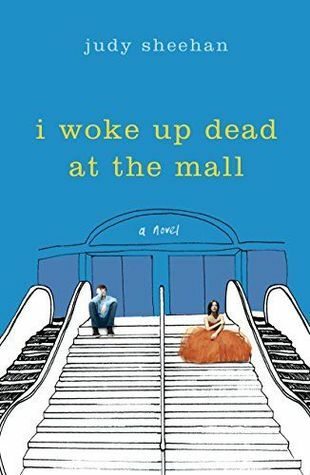 I Woke Up Dead at the Mall is more about coming to terms with a great loss — in this case, the characters’ own human lives — and finding peace to move on. It’s a backwards way of looking at grief, and that’s what makes this book work so brilliantly! Sheehan cleverly turns the subject upside down, and narrates her story from the perspective of the deceased, rather than the bereaved. The twist still portrays the challenge and heartache of grief and loss, but leaves room for some irreverence, tasteful humor, and lightness. The combination is an easy to read, accessible book about death that is enjoyable. Also, Sheehan’s afterlife limbo for murdered teens is the freaking Mall of America. The humor and writing in this book is just so damn witty. It adds an unexpected but delightful spice to a book about an otherwise very serious subject: death, and solving a murder. I mean, the smarts involved just in thinking up such a wildly unexpected combination deserves some applause. This wasn't a BAD book but it really could have been so much better in so many ways, so that's where my feelings and review end up. I was hoping for dark comedy, black humor, ghostly sort of story. It turned out to be a little too cheesy, a little too immature, and I didn't like the ending. It just felt very typical YA and too tropey. All of the main characters in this book ended up at the Mall of America after their death, all came from New York. But... why? Because the Mall of America is a big and a lot of people get murdered in New York...? Even if there was logic there, it wasn't worth making that connection and there really wasn't a reason for the mall concept except to make a mall walker joke and associate dormitories with stores. It added a certain cheesiness to the story that I didn't find cute and I felt like it could have been a lot more meaningful in a different setting instead of creating a silly atmosphere. I also never really understood why Sarah was murdered and the details of her murder were... odd. It all made sense, all was revealed, but the motive was just so flimsy and too obvious. For that to be the whole reason behind the WHOLE BOOK? Eh. Overdone. Come up with something new. "Most malls are haunted. Did you know that? The Boy saves the extra-big one for New Yorkers." I was immediately attracted to the cool cover and intrigued by the title. After reading a sample chapter, I knew I wanted to read this novel. Sixteen-year-old Manhattan girl Sarah Evans wakes up dead at the Mall of America in Minnesota in her bridesmaid dress, the apparent victim of murder by poisoning. "I had actually kept my mouth shut, opting not to tell the bride that I'd never be caught dead in mango "Most malls are haunted. Did you know that? The Boy saves the extra-big one for New Yorkers." Sixteen-year-old Manhattan girl Sarah Evans wakes up dead at the Mall of America in Minnesota in her bridesmaid dress, the apparent victim of murder by poisoning. "I had actually kept my mouth shut, opting not to tell the bride that I'd never be caught dead in mango. Now here I was. Dead. In mango." Along with her Death Coach and a few fellow dead New Yorker teens, Sarah must learn to let go of unfinished business so that she can move on and avoid becoming a doomed mall walker. This process includes visiting her own funeral, a "Thornton Wilder Day" in which she revisits one day in her previous life, and even group therapy. This YA has a little bit of everything- supernatural elements, mystery, romance, and a lot of humor. The novel was unique and entertaining. New York native Sarah Evans was suffering from a terrible stomach ache at her father's wedding when she passes out. She wakes up across the country in the Mall of America...dead. And still wearing the horrible mango chiffon bridesmaid dress she was wearing during her demise. Now, she must figure out who murdered her and why, so that she might be able to save her father's life back in the land of the living. I was really excited by this book's title and summary, but the writing fell flat. At first New York native Sarah Evans was suffering from a terrible stomach ache at her father's wedding when she passes out. She wakes up across the country in the Mall of America...dead. And still wearing the horrible mango chiffon bridesmaid dress she was wearing during her demise. Now, she must figure out who murdered her and why, so that she might be able to save her father's life back in the land of the living.